Determining how the Caribbean plate moves with respect to the neighboring North America and South America plates has been a major challenge. Geologic plate motion models using seafloor magnetic anomaly rates, transform fault azimuths, and slip vectors are challenging due to sparse data. The only rates come from the Cayman Spreading Center, and seismicity at the eastern boundary is low due to slow convergence. Moreover, the boundary geometry is still unclear, since the Caribbean plate's north and south boundaries are complex deformation zones. 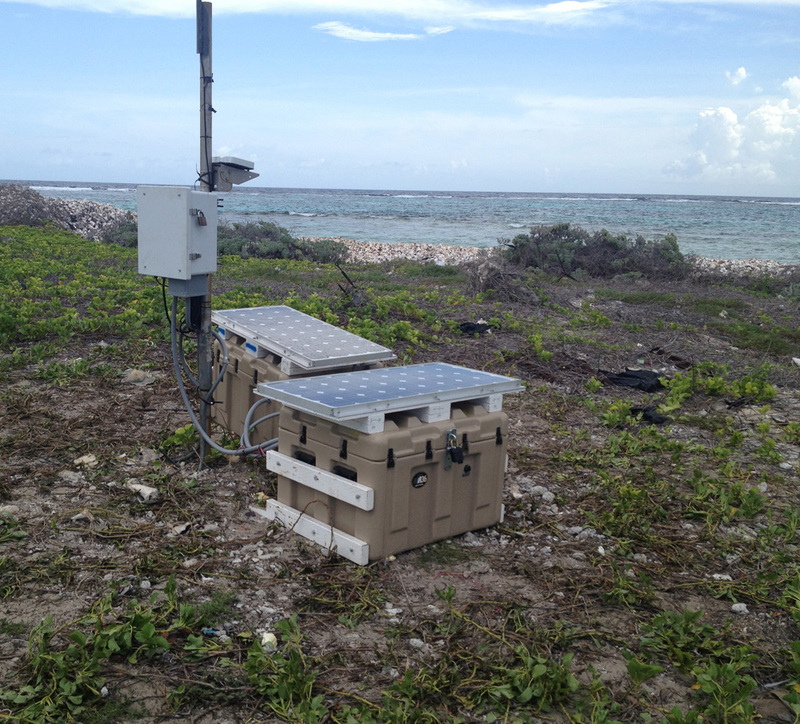 GPS data continues to provide key clues to the Caribbean region’s geologic faults. 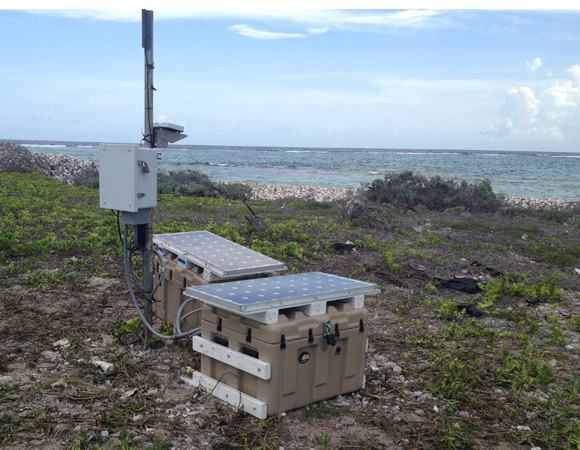 GPS stations are currently being installed as part of the Continuously Operating Caribbean GPS Observational Network (COCONet), strengthening the indispensible collection of data belonging to a region that faces many atmospheric and geologic natural hazards. A whirlwind four-day trip in September resulted in maintenance of two of the most challenging GPS sites in COCONet. UNAVCO field engineers John Sandru and Michael Fend worked with Paul Williams of the University of the West Indies' Earthquake Unit to upgrade Jamaican sites CN10 and CN11 on the tiny islands of Morant Cay and San Pedro Cay, respectively, about 80 miles off the coast from Kingston, Jamaica. 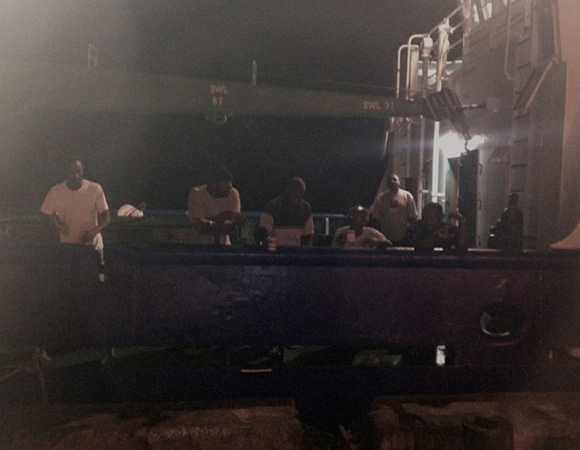 The trio hitched a ride with the Jamaican Port Authority to reach the islands, which are only accessible by boat. 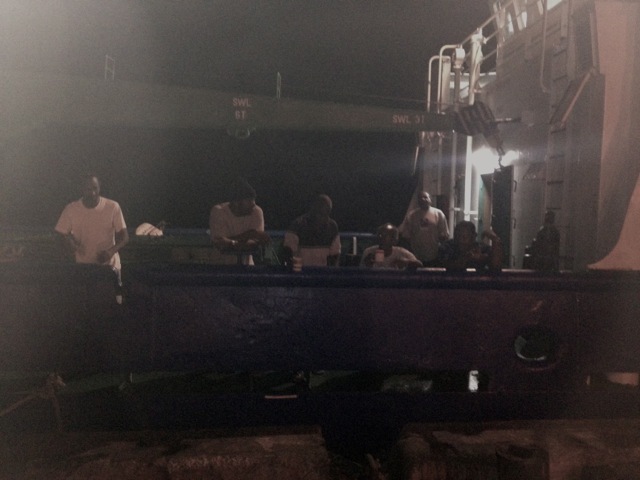 The team first visited site CN10 on Morant Cay, the larger but more remote island. Work there consisted of swapping out a faulty communications system (the Broadband Global Area Network, or BGAN) and rewiring the batteries to reinstall battery quick disconnects to facilitate future battery swaps. The next stop was San Pedro Cay, a surprisingly populated island about half the size of a football field, where generators power lights and music every evening. Like many sites in COCONet, CN11 is subject to a highly corrosive environment. 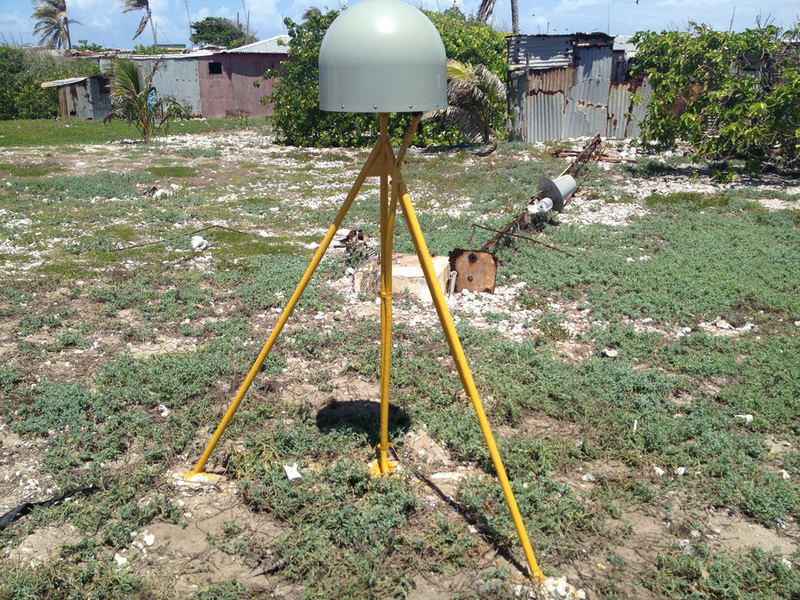 The team worked to make site CN11 more hurricane and corrosion resistant by painting the GPS antenna monument with multiple coats of marine paint to counter rust; replacing the metal enclosure with a smaller, more waterproof, fiberglass enclosure to counter corrosion, better resist high winds, and withstand a higher storm surge; upgrading the battery bank from 400 amp hour to 1200 amp hour; and remounting the solar panels from the enclosure mast onto the Hardigg cases housing the batteries to protect them from high winds. Work at the site took about 12 hours. The UNAVCO engineers left Boulder, Colorado at 3:30 a.m. on Monday, spent four days at sea, and returned to Boulder at 10 p.m. on Friday. Who needs a hotel when there is a boat? 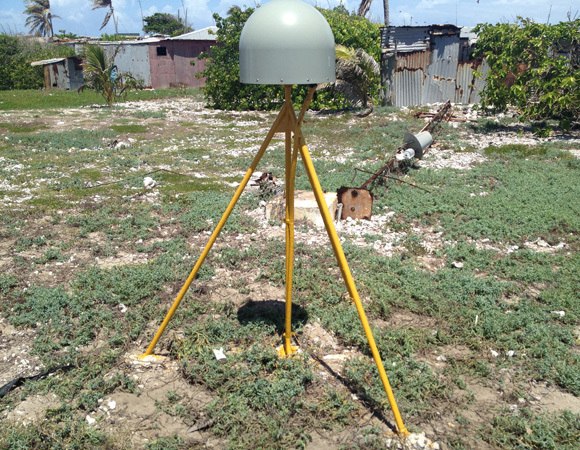 The COCONet project was funded by the National Science Foundation (NSF) with the aim of developing a large-scale geodetic and atmospheric infrastructure in the Caribbean that will form the backbone for a broad range of geoscience and atmospheric investigations and enable research on process-oriented science questions with direct relevance to geohazards. The Caribbean Plate is a unique opportunity to monitor movement, because most of the plate rests underwater. Prior to this endeavor there has been limited monitoring of the Caribbean Plate. 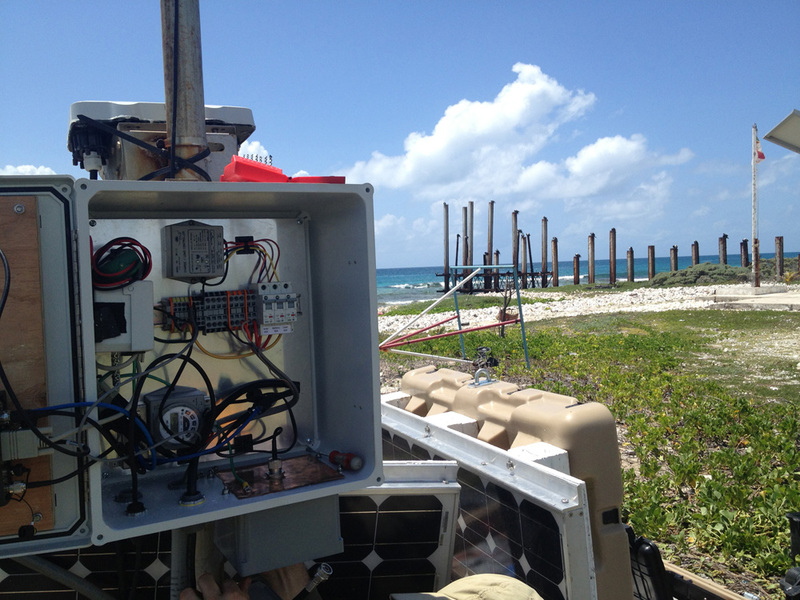 Furthermore, each site is equipped with a weather station which records vital atmospheric data that is analyzed by our friends at the University Corporation for Atmospheric Research (UCAR) to monitor the movement of potentially deadly hurricanes.